Can’t afford the high ticket price? or just can’t be bothered to sit in the human traffic or sink amidst the hype? 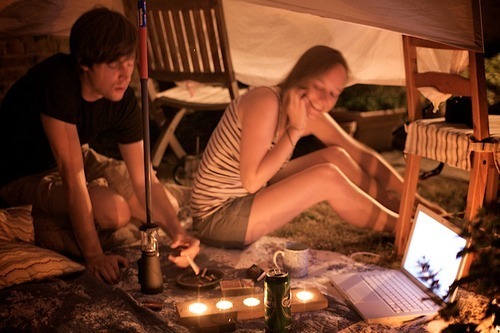 Do what Hannah and Nick did and create your own Garden Glastonbury. I dropped by this evening and caught Stevie Wonder’s set streaming on the MacBook, complete with incense and mood lighting in their makeshift (VIP area) yurt fashioned from a bed sheet and chairs.